Mueller Just Filed His Report. What Happens Next? After nearly two years of watching and waiting, special counsel Robert Mueller’s investigation into Russian interference in the 2016 election is finally complete. Attorney General William Barr announced on Friday that Mueller has submitted his confidential report, summarizing key information from the investigation. But anyone craving definitive answers about what Mueller found shouldn’t breathe a sigh of relief just yet — there’s still a lot of uncertainty about how much of the Russia investigation’s findings will be made public. Barr has said in a letter to Congress that he is reviewing the report and anticipates being in a position to share Mueller’s “principal conclusions” with Congress as soon as this weekend. And a Department of Justice spokeswoman told ABC News that the document given to Congress is expected to be released to the public as well (although a specific timeline was not specified). Now it’s up to the attorney general to determine what parts of Mueller’s confidential report (if any) will be publicly released, beyond the required summary that is being sent to Congress. During his confirmation hearings, Barr was cagey about whether he’d commit to making Mueller’s findings public. In today’s letter, he said he would determine what he can release “consistent with the law” and Justice Department policies. But House Democrats have already drawn battle lines by demanding that the full report be released to Congress and the public. If releasing the full report is not what Barr wants or feels he’s able to do, though, the process of extracting the report from the Department of Justice will likely be long and laborious, potentially involving subpoenas and even a showdown over executive privilege. Does this mean we’re not getting a report? The problem is that Mueller is under no obligation to provide such a thorough accounting, whether in his confidential report to Barr or elsewhere. He is required, at minimum, to outline his reasoning behind the major actions in the investigation — why he filed charges against some people and didn’t charge others. But this is a requirement that could be interpreted any number of ways — especially if there are any bombshells related to the president that haven’t yet been revealed. As I wrote in January, there are a range of possible outcomes for the Mueller investigation, and each comes with different levels of political and legal risk for Trump. Mueller could conclude that Trump is implicated in some kind of criminal behavior, related to either coordination with Russia in the 2016 election or attempts to obstruct justice as the probe unfolded. Or if Trump isn’t accused of wrongdoing, someone close to him could be. Even if Mueller doesn’t believe that he can charge the president, he could outline criminal or other misconduct by Trump in the section of his report where he names people he chose not to indict. And then, of course, there’s the possibility that the president and his close associates aren’t implicated in any further wrongdoing and that we already know the content of Mueller’s report, through the court documents that have already been released. And even if Mueller’s report does contain new and important information, it won’t necessarily provide a clear path forward — and if it does, it could be dismissed as politically motivated. One of Mueller’s predecessors — Whitewater independent counsel Ken Starr — issued a long and graphic report, which included specific guidance to Congress about which presidential conduct might be impeachable. This report was made public and seriously undermined Starr’s credibility. Starr was operating under a different set of guidelines, but there’s still a lesson for Mueller here: The more restraint Mueller shows, the less likely he is to be tarred as a partisan actor trying to take down the president. Then again, it’s entirely possible that even if Mueller’s full report is made public, it won’t tell us much that we don’t already know. It could be that there is no new information to share or Mueller may not feel that he’s free, as a Department of Justice prosecutor, to reveal a lot of new details that haven’t already been made public as part of a criminal case. That’s because prosecutors are generally discouraged from talking about what they’ve found as part of an investigation unless they need to reveal it as part of a case. Other information may be classified, and it’s also possible that Mueller may view political questions related to impeachment as outside his purview as a prosecutor and therefore feel they’re not appropriate to engage with in his report, regardless of what he finds. 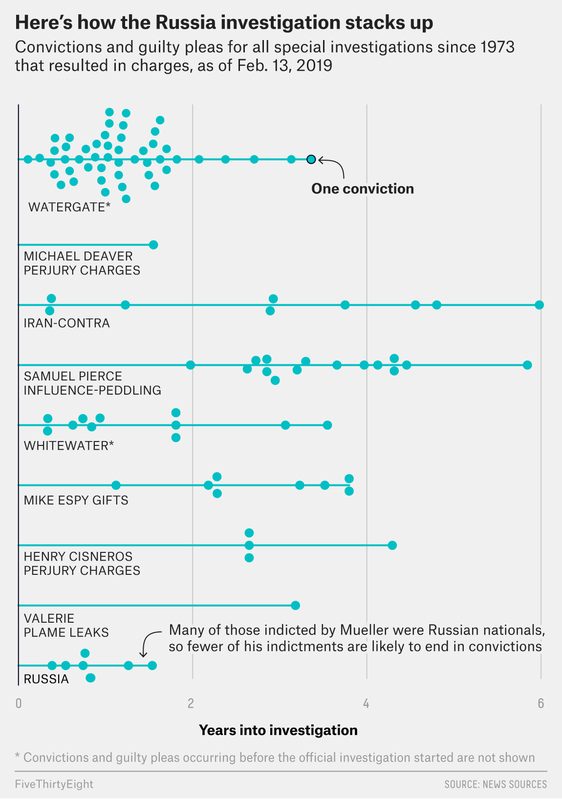 For more on the political implications of the report, see The Politics Of The Mueller Report.